Learn easier thanks to thematic lessons! Get to know natural expressions used by native speakers! Explanations will help you understand the cultural differences! Get to know Japanese and Japanese culture together! Did you know that Japanese is in the top most used languages on the Internet? Meaning that learning Japanese will open many new opportunities and broaden your social cycle! Its grammar is very close to the Korean and learning Japanese will help link your knowledge to other languages. Moreover, Japan is the third economy in the world! The Japanese vocabulary will bring many benefits in the academic and professional fields, you can learn more about advanced technology, find new partners for your business or a study program there. This country is rich in history and its culture is very unique and different. Learn Japanese and discover Japan from within! 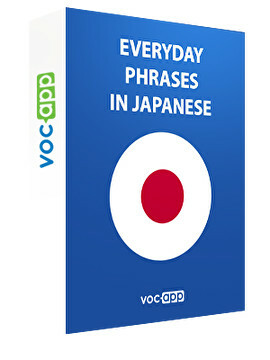 Learn basic Japanese phrases with VocApp! We prepared a special course for you to learn Japanese online! There's no need to look for a tutor or buy expensive courses anymore - everything is ready! This course includes common Japanese phrases for you to use in day to day conversations. The basic Japanese words and useful Japanese phrases will help you express your thoughts in various situations. Each of the flashcards will present you one of the common Japanese words with a picture, the Japanese to English translation, example sentences, hints and pronunciation. This way, you will enhance your Japanese vocabulary and soon be able to form your first Japanese sentences. Some of the basic Japanese phrases you will learn are thank you in Japanese, good evening in Japanese, besides, you will now know how to say please in Japanese and you're welcome in Japanese. Knowing how to pronounce excuse me in Japanese will help you in many situations. This course will also teach you how to say my name is in Japanese, so you can introduce yourself to new people and make friends! Don't forget to take a look at our other Japanese courses, for example Japanese in 1 day and Japanese: day 2. They will teach you more basic words and phrases. Are you ready to start your Japanese journey?